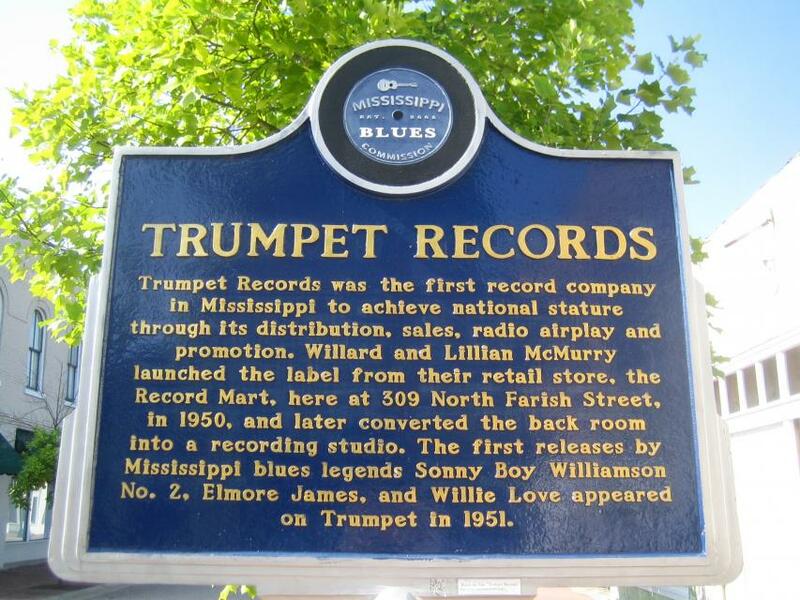 Willard and Lillian McMurry, who were furniture dealers by trade, entered the record business by chance, when they acquired a stock of blues and rhythm & blues 78 rpm discs with the inventory of a hardware store they purchased at this site in 1949. 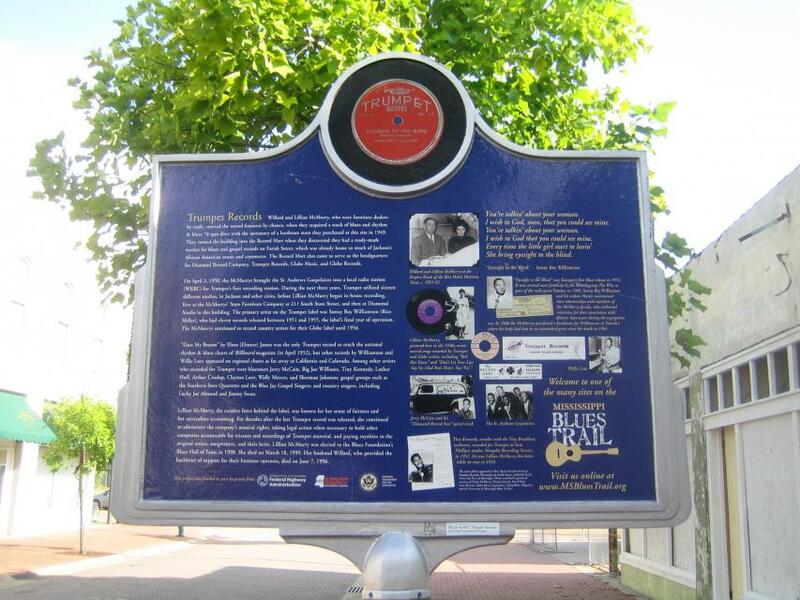 They turned the building into the Record Mart when they discovered they had a ready-made market for blues and gospel records on Farish Street, which was already home to much of Jackson's African American music and commerce. The Record Mart also came to serve as the headquarters for Diamond Record Company, Trumpet Records, Globe Music, and Globe Records. On April 3, 1950, the McMurrys brought the St. Andrews Gospelaires into a local radio station (WRBC) for Trumpet's first recording session. During the next three years, Trumpet utilized sixteen different studios, in Jackson and other cities, before Lillian McMurry began in-house recording, first at the McMurrys' State Furniture Company at 211 South State Street, and then at Diamond Studio in this building. The primary artist on the Trumpet label was Sonny Boy Williamson (Rice Miller), who had eleven records released between 1951 and 1955, the label's final year of operation. The McMurrys continued to record country artists for their Globe label until 1956. "Dust My Broom" by Elmo (Elmore) James was the only Trumpet record to reach the national rhythm & blues charts of Billboard magazine (in April 1952), but other records by Williamson and Willie Love appeared on regional charts as far away as California and Colorado. Among other artists who recorded for Trumpet were bluesmen Jerry McCain, Big Joe Williams, Tiny Kennedy, Luther Huff, Arthur Crudup, Clayton Love, Wally Mercer, and Sherman Johnson; gospel groups such as the Southern Sons Quartette and the Blue Jay Gospel Singers; and country singers, including Lucky Joe Almond and Jimmy Swan. Lillian McMurry, the creative force behind the label, was known for her sense of fairness and her meticulous accounting. For decades after the last Trumpet record was released, she continued to administer the company's musical rights, taking legal action when necessary to hold other companies accountable for reissues and recordings of Trumpet material, and paying royalties to the original artists, songwriters, and their heirs. Lillian McMurry was elected to the Blues Foundation's Blues Hall of Fame in 1998. She died on March 18, 1999. Her husband Willard, who provided the backbone of support for their business ventures, died on June 7, 1996. This marker can also be identified by its HM code. You can use the hashtag #HMYJN in tweets, and any other place where you might refer to this marker, including when searching on this site.